PR: Apple today unveiled the new iMac featuring Mac OS X running on the new Intel Core Duo processor, delivering performance that is up to twice that of its predecessor. The widely praised iMac design now features dual-core processors, a built-in iSight video camera for video conferencing out-of-the-box, and the breakthrough media experience of Front Row with the Apple Remote for a simple, intuitive and powerful way for consumers to enjoy their content from across the room. Starting at just $1,299, every new iMac comes with iLife '06, the next generation of Apple's award-winning suite of digital lifestyle applications featuring major new versions of iPhoto, iMovie HD, iDVD, GarageBand and introducing iWeb, a new iLife application that makes it super-easy to create amazing websites with photos, blogs and Podcasts and publish them on .mac for viewing by anyone on the Internet with just a single click. The new iMac is shipping today, and is the first of a new generation of Macs featuring Intel processors that Apple will roll out during 2006. "The iMac has already been praised as 'the gold standard of desktop PCs', so we hope customers really love the new iMac, which is up to twice as fast," said Steve Jobs, Apple's CEO. "With Mac OS X plus Intel's latest dual-core processor under the hood, the new iMac delivers performance that will knock our customers' socks off." The new iMac features Apple's breakthrough Front Row media experience and the Apple Remote, a simple way for customers to enjoy the content they have on their iMac - including songs from their iTunes music library, photo slideshows from iPhoto, videos including TV shows, Podcasts, iMovies and DVDs, and popular movie trailers streamed from apple.com - all from across the room. Every new iMac comes with a built-in iSight video camera for out-of-the-box video conferencing using Apple's award-winning iChat AV software, or recording a video Podcast or iMovie using iLife '06. The built-in iSight video camera takes advantage of the Intel Core Duo processor to deliver up to four times the resolution over the previous model. Each iMac also includes Photo Booth, Apple's fun-to-use application that lets users take quick snapshots with the built-in iSight video camera, add entertaining visual effects and share their pictures with the touch of a button. The new iMac comes standard with a SuperDrive for burning professional-quality DVDs, 512 MB of 667 MHz DDR2 SDRAM memory expandable to 2 GB, hard drive storage capacity up to 500 GB, and ATI Radeon X1600 PCI Express-based graphics with 128 MB of GDDR3 memory for outstanding graphics performance and realistic game play. With the latest high-performance connectivity options, the new iMac includes built-in 10/100/1000 BASE-T Gigabit Ethernet for high-speed networking, built-in AirPort Extreme for fast 54 Mbps wireless networking, built-in Bluetooth 2.0+EDR (Enhanced Data Rate), a total of five USB ports (three USB 2.0) and two FireWire 400 ports. The new iMac now includes mini-DVI video output to connect up to a 23" Apple Cinema HD Display. With mini-DVI and the new iMac's extended desktop mode feature, users can more than double their available screen real estate. The new iMac was designed to be the perfect computer for iLife '06, the next generation of Apple's award-winning suite of digital lifestyle applications featuring major new versions of iPhoto, iMovie HD, iDVD, GarageBand, and introducing iWeb, a new iLife application that makes it super-easy to create amazing websites with photos, blogs and Podcasts and publish them on .mac for viewing by anyone on the Internet with just a single click. All the iLife '06 applications are Universal applications that run natively on the new Intel-based iMacs for maximum performance. Every new iMac comes with the latest release of the world's most advanced operating system, Mac OS X version 10.4.4 "Tiger" including Safari, Mail, iCal, iChat AV, Front Row, and Photo Booth, running natively on Apple's first Intel-based desktop. Mac OS X Tiger includes an innovative software translation technology called Rosetta that lets customers run most Mac OS X PowerPC applications seamlessly. The new iMac is shipping today and will be available through the Apple Store, Apple's retail stores, and Apple Authorized Resellers. the infrared Apple Remote, Mighty Mouse and Apple Keyboard. Build-to-order options and accessories include up to 2 GB DDR2 SDRAM, 250 GB and 500 GB Serial ATA hard drives, up to 256 MB of GDDR3 video memory on the 20" iMac, iWork '06 (preinstalled), AirPort Express and AirPort Extreme Base Station, Apple Wireless Keyboard, Apple Wireless Mouse, Apple USB Modem and the AppleCare Protection Plan. PR: Topping off an award-filled 2005 in which the NewerTech miniStack was named Accessory of the Year by 123Macmini, an Editors' Choice by Mac Addict, and Top Product by Macworld, Newer Technology Inc. (NewerTech) is kicking off 2006 with the premier of a sleek upgraded design at the Macworld Conference & Expo in San Francisco. "At NewerTech our goal is to provide the best solutions for today's technology users at the best prices possible. When we hear actual users say they 'can't do without' our miniStack, that's an amazing reward," says Larry O'Connor, president of NewerTech. The NewerTech miniStack retails for less than $139.99 for an 80 Gigabyte (GB) version and is available in capacities up to 500 GB at 7200 rpm. An economical 'add your own hard drive' kit is available for $79.99. The newly enhanced NewerTech miniStack™ v2 is engineered to increase drive capacity 80- to 500 GB while adding multiple FireWire and USB port options ergonomically divided between rear and side configurations. Although specifically designed to work in conjunction with the Mac mini, the NewerTech miniStack™ works with any Apple or PC computer with an available FireWire or USB port. All NewerTech miniStack models feature data buffers of 2- or 8 Megabytes (MB), the latest Oxford 911+ chipset and integrated 2-Port FireWire and 3-Port USB 2.0/1.1 powered hubs. Each NewerTech miniStack features a smart power switch so the drive turns on and off with its corresponding mini or PC and intelligent thermal monitoring which automatically engages and varies fan speed according to the temperature. 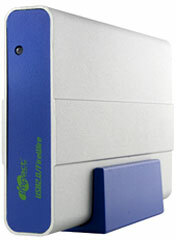 The advantageous dimensions of the NewerTech miniStack are 6.5" x 6.5" x 1.5". PR: The new 20" Acer Ferrari LCD display features elegant and stylish design, use of exotic materials, and advanced technologies such as Acer CrystalBrite. The partnership between Acer and Ferrari dates back to February 2003 when Acer became the Official Supplier of the team. Since that time, Acer has been developing and selling Ferrari notebooks with AMD processors. The Ferrari notebook designed by Acer enjoyed such success that Acer has now announced the new Ferrari F-20 LCD Monitor, designed and created for professionals and enthusiasts. The new 20" Ferrari LCD display stands out for its elegant and stylish design, for the use of exclusive materials and for the adoption of advanced technologies such as Acer CrystalBrite, which guarantees greater luminosity and brighter images, thus supporting sophisticated professional applications, games and digital activities. Acer CrystalBrite guarantees the best possible visual experience, by preventing the diffusion of surrounding light and internal rays. In a normal working environment, such as an office, regular LCD panels tend to scatter light, thus falsifying colors. Compared to normal TFT LCDs, Acer CrystalBrite technology is able to read color coordinates more accurately, thus minimizing distortion and creating high-fidelity colors in all environments. To meet the increasing demands for Digital Home solutions Acer also integrated a sophisticated Media Module for all Ferrari LCD Monitors featured with audio/video interfaces to connect any Media Device plus a fully functional integrated TV Tuner including Remote Control. The Ferrari F-20 LCD monitor, designed by Acer, supports resolutions of up to 1680 x 1050 pixels combined with excellent color saturation and perfectly sharp images. Furthermore, the Ferrari F-20 monitor is extremely versatile and highly performing, with 8ms response rates, and 800:1 contrast ratios, providing highly detailed images that are ideal for heavy-duty data applications. The Ferrari LCD line of products guarantees professional users the security of long-term performance, quality design, and excellent ergonomics. Acer and Ferrari share an ability to develop coherent strategies and to consolidate their successes worldwide. These two companies have demonstrated their affinity, not only in their close collaboration - sealed with the partnership agreement - but also in their desire to place their logos side by side on high-tech product lines aimed at professionals and demanding IT enthusiasts, on the constant look out for complete, reliable and exclusive solutions. The Acer Ferrari F-20 will available through Acer authorized resellers throughout North America starting in April at approximately $599. Product under license of Ferrari Spa. Ferrari, the PRANCING HORSE device, all associated logos distinctive designs are trademarks of Ferrari Spa. Editor's note: This would be an über-cool display to use with a Mac mini. "Seagate's system, shown this week in prototype form and codenamed 'Tornado', packs in a regular HDD, linked to the outside world through a standard External Serial ATA port, the company told The Register. The drive is hot-swappable, and connects through the ESATA connector to a cradle which, in turn, connects to a PC's USB 2.0 port." PR: Other World Computing (OWC) has announced the introduction of a new, significantly enhanced 800 FireWire-equipped version of the award-winning Mercury On-The-Go line of ultra-portable, high-capacity 2.5" drives for storage on the go. The new drive will be on display at the 2006 Macworld Conference and Expo in San Francisco beginning January 10, 2006. Armed with 160 gigabyte (GB) of storage capacity and running at 5400- or 7200 revolutions per minute (RPM), the new On-The-Go pro series 800/400+USB 2.0 makes OWC the first company shipping a portable FireWire/USB 2.0 drive of this capacity. The new 2006 On-The-Go pro series 800/USB 2.0 doubles the potential performance power of the previous incarnation of the On-The-Go line, which was already recognized as the highest performing drive ever available in such a small, ultra-portable size by leading technology authorities including Mac Addict, Macworld and Maximum PC. "Adding FireWire 800 capability to the unparalleled performance, quality and value of the On-The-Go line of portable storage solutions is an absolutely amazing breakthrough," said CEO Larry O'Connor. "Other World Computing is dedicated to making the newest technology available to the world. There is no other product available that performs at this level." Mercury On-The-Go portable storage solutions are priced as low as $129.99, and offered with capacities from 40- to 160 GB and speeds up to 7200 RPM on the 100 GB models and 5400 for 160 GB models to handle even the most intense audio and video projects 'On-The-Go'. On-The-Go plug-and-play drives are compatible with all Apple OS Versions 8.5 through 9.2.x; Apple OS X 10.0.3 and higher (including OS X 'Tiger' 10.4.x); Microsoft Windows 98SE, ME, 2000, XP; any OS or electronic device with FireWire and/or USB data ports, including digital video and still cameras. PR: Miglia Technology, a leading manufacturer of video, audio and storage products for Mac and Windows, today announced its partnership with Western Digital and the launch of Miglia DualDisk with WD's disk drives. Eric Ferraz, Director of Product Management at Miglia said "Miglia have decided to use exclusively Western Digital drives as they provide the most robust and reliable solution for end users. Our faith in WD's solutions based on low heat and high MTTF means that we are able to offer a 5 year RTB warranty preconfigured DualDisk's, a unique offering in this market." Klaas deVos, Vice President EMEA with WD said: "Miglia is an ideal partner for us as they constantly deliver world-class solutions to an ever demanding market place. Our Caviar Raid Edition drives are a perfect match for the Miglia DualDisk, they are cool, quiet and highly reliable, the stated MTTF (Mean Time To Failure) of 1.2 million hours is unrivaled in the industry. Following last year's successful launch of the Miglia DualDisk, Miglia is pleased to announce that the DualDisk has been given a makeover and redeveloped using Western Digital technology for more demanding use in today's work and home environment. Still integrating two hard drives in a unique horizontal format, the ultra-slim aluminum enclosure combines vast amounts of storage space with incredible data transfer rates peaking at 88 MB/sec. Thanks to its advanced DCS™ cooling system, the hard drives run at low temperatures at all times, thereby lengthening their life span and securing your data. Available in capacities of 320 GB, 500 GB and 640 GB and as an empty case, the Miglia DualDisk provides excellent secure expansion for both PC and Mac platforms. In addition DualDisk is now available using the ultimate quality WD Caviar 'Raid Edition' drives, these have 16 MB of cache per device and an MTBF of 5 times a conventional Disc Drive. Designed and built to last, DualDisk is made from robust, shock resistant aluminum, giving the best possible protection for your valuable data. All units carry a full 5 year RTB warranty. A list of distributors and resellers is available on Miglia's website. PR: RadTech, makers of mobile computing and iPod accessories and more, have announced immediate availability of several new products and solutions. Take full control of your RadTech Bluetooth mouse with RadMouse - RadTech's Bluetooth HID Driver & System Preference. Assign mouse buttons and scroll wheel to single or multiple keystrokes or actions; adjust cursor tracking and scrolling speed, acceleration curves and more. All custom settings can be applied on a global, or application-by-application basis. RadMouse only affects RadTech Bluetooth mice, and can be used alongside other HID driver software. Ruggedized 2.5" and 3.5" data storage enclosures combine multilayer hardware protection with blistering data transfer speeds. Available with ultra-secure, platform independent 64-bit hardware encryption using patented Enova X-Wall™ technology, encrypting and decrypting data in real time, with no data transfer speed degradation. All models include USB 1.1 & 2.0 connectivity, plus a choice of FireWire 400 and/or FireWire 800. A selection of retractable connection cables and earbuds for iPod - USB, FireWire and analog varieties. PR: Applied Micro Circuits Corporation today announced its entrance into the Macintosh storage market with RAID technology for Apple Computer's high-end PowerMac G5 Quad workstation. AMCC brings the Macintosh market many years of experience in developing high performance RAID controller systems for the Linux and Windows environments. Its new Sidecar external RAID solution leverages the company's award-winning 3ware StorSwitch(TM) architecture, which integrates custom-designed firmware, hardware and management software optimized for high bandwidth applications and solves the problem of how to provide terabytes of highly reliable storage expansion to individual G5 workstations. At this week's Macworld conference, AMCC will provide a sneak peek at the technology, due for release in the second quarter of 2006. "Our 3ware Sidecar external RAID solution addresses a critical need for high-performance, high-capacity, easy to use data storage for Macintosh workstation users," said Michael Joyce, director of storage marketing at AMCC. "We've responded to enduser requests to provide the protection of RAID with the flexibility and expansion capabilities of SATA II storage. With two terabytes of storage expansion, Sidecar delivers dramatic enhancements in speed and scalability." "The Macintosh storage market has been largely ignored by the major storage players," said Greg Schulz, founder and storage consultant at StorageIO based in Stillwater, Minnesota. "AMCC's entry into the Macintosh storage market will be welcomed by Mac users who require enterprise like functionality with greater storage performance and capacity for applications such as digital video capture, post-production and graphics." Visitors to booth 511 at Macworld Expo can see AMCC's RAID technology in action in side-by-side performance demonstrations. Students of San Francisco State's College of Fine Arts will also demonstrate the technology's overall performance and ease-of-use by editing video in real-time. "It's about time the Mac market has access to this level of storage performance, capacity and protection," said Alan Giorgi, operating systems analyst and systems administrator for San Francisco State University's College of Creative Arts. "We produce a lot of award-winning video and audio. Our work requires RAID controllers that can support a sustained high throughput, reliable uptime and considerable storage capacity. AMCC has produced a solution that delivers." Independent music producer Stephen Burich will demonstrate Sidecar's capabilities for real-time audio editing. "I've had the opportunity to evaluate AMCC's technology, and I'm impressed with how it enables editing and production performance that was previously unattainable by other solutions," said Burich. PR: GizMac Accessories LLC announces the 25U XRackPro Noise Reduction Enclosure at the Macworld Exposition. Building on their success with the 12U XRackPro Noise Reduction Enclosure cabinet for Apple Xserve and Xserve RAID systems, GizMac Accessories debuts their new 25U XRackPro. The new 25U XRackPro, along with the current 12U model, are on display in booth #2211 at the Macworld Expo. Visitors to the GizMac booth will be able to view both models, as well as their accessories, throughout the week. "Our XRackPro reduces noise up to 75% when multiple pieces of equipment are mounted inside," says Tim Cave, founder of GizMac, "The new 25U rack mount enclosure cabinet will have features and accessories similar to the current 12U model while providing more than twice the rack mount capacity." With the additional height the 25U XRackPro provides, there is room for numerous pieces of rack mount equipment inside. Apple Workgroup Cluster users will be able to install up to 25 Xserve servers inside the enclosure cabinet. Post production, graphics and other G5 workstation users can use up to two G5 towers plus a couple Xserve RAID systems inside the 25U XRackPro. For other users, various combinations of computers, storage and other equipment such as switches, battery backups, etc. can be placed inside. Further details on the new 25U XRackPro rackmount noise reduction enclosure cabinet can be found on the GizMac Accessories website.